A center for the blind in Yemen’s capital of Sanaa was hit in an airstrike that was presumably carried out by a Saudi-led coalition targeting Houthi forces, locals told media. Residents said the air-strikes targeting Houthi forces intensified on Tuesday before a care center for the blind was hit, Reuters reports. The third floor of the Noor Center for the Blind in the Safiah district was damaged in the 1 a.m. incident, according to the Middle East Eye. No casualties in the bombing were reported. Noor Center is one-of-a-kind in Yemen, receiving funding from one of the World Bank’s projects in the country. After the airstrike, the center’s deputy manager, Mohammed Daylami, blamed Saudi Arabia and its allies for “having no clue about the rules and ethics of war." "What did the disabled children do to do deserve being hit by an air strike? Where are the NGOs? Where is the UN?" Daylami told Saba news agency. 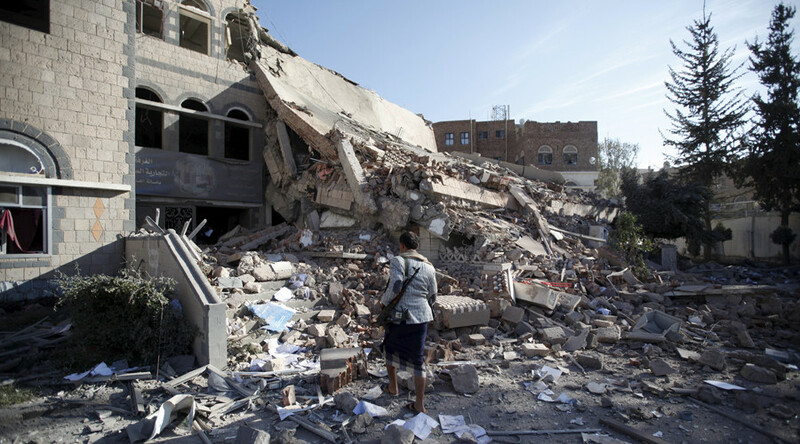 Saudi-led airstrikes resumed in Yemen as a formal ceasefire agreed on 15 December between the coalition and the Houthi rebels expired over the weekend. However, the Saudi-Arabian coalition kept violating Yemeni air space even during the formal ceasefire, Sanaa-based political analyst Hassan Al-Haifi told RT. Air raids often hit civilians with weapons prohibited under the rules of engagement, he added. “They are using every kind of weapon available to them. The military targets are far fewer than civilian targets,” Haifi told RT, adding that the Saudis have recently bombed a Coca-Cola factory and a dairy farm, in addition to numerous schools and hospitals. The coalition has been heavily criticized for the way it conducts its airstrikes, with Human Right Watch saying that “their disregard for the safety of civilians is appalling." The coalition was also blamed for hitting a Doctors Without Borders hospital in Sanaa in December. The instability in Yemen started in 2011 when President Ali Abdullah Saleh was toppled during Arab Spring protests. In 2014, Houthi Shia rebels supported by pro-Saleh forces rose in rebellion and seized big territories of Yemen, including Sanaa. The United Nations says the death toll from the fighting in Yemen has reached 2,795 as of Tuesday. At least 81 people were killed in December alone. The number of wounded since the start of hostilities in March stands at 5,234.